Placements: G. B. Pant University of Agriculture and Technology was the first Agricultural University to establish a full-fledged Directorate of Placement and Counselling to advise and prepare the students in getting suitable jobs. On an average, 650 and 300 students take degrees in graduate and post-graduate programmes, respectively every year in 134 disciplines. These graduates and post-graduates are well trained and equipped to manage various jobs in development departments, academic institutions, nationalized banks, industries and other corporate sectors.The Directorate of Placement and Counselling is headed by a Director with the help of a Joint Director who are assisted by two Assistant Directors. Enough secretariat and technical assistance is available to manage the various activities of the Directorate.The main aim of the Directorate is to provide effective day to day guidance to the students for purposeful placement on one hand and to introduce them to prospective employers through campus interviews on the other hand. Campus: After independence, development of the rural sector was considered the primary concern of the Government of India. In 1949, with the appointment of the Radhakrishnan University Education Commission, imparting of agricultural education through the setting up of rural universities became the focal point. Later, in 1954 an Indo-American team led by Dr. K.R. Damle, the Vice-President of ICAR, was constituted that arrived at the idea of establishing a ‘Rural University’ on the land-grant pattern of USA. As a consequence a contract between the Government of India, the Technical Cooperation Mission and some land-grant universities of USA, was signed to promote agricultural education in the country. The US universities included the universities of Tennessee, the Ohio State University, the Kansas State University, The University of Illinois, the Pennsylvania State University and the University of Missouri. The task of assisting Uttar Pradesh in establishing an agricultural university was assigned to the University of Illinois which signed a contract in 1959 to establish an agricultural University in the State. Dean, H.W. Hannah, of the University of Illinois prepared a blueprint for a Rural University to be set up at the Tarai State Farm in the district Nainital, UP. In the initial stage the University of Illinois also offered the services of its scientists and teachers. Thus, in 1960, the first agricultural university of India, UP Agricultural University, came into being by an Act of legislation, UP Act XI-V of 1958. The Act was later amended under UP Universities Re-enactment and Amendment Act 1972 and the University was rechristened as Govind Ballabh Pant University of Agriculture and Technology keeping in view the contributions of Pt. Govind Ballabh Pant, the then Chief Minister of UP. 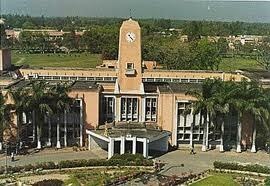 The University was dedicated to the Nation by the first Prime Minister of India Pt Jawaharlal Nehru on 17 November 1960. Central library: University Library was established in 1960 with the objectives of fulfilling the information needs of its students, teachers, researchers and other administrative staff. The library supports the university activities (i.e. teaching, research and extension) by providing resources, high quality services and professional expertise to enable the effective discovery and use of information. Online information sources are increasing now a day. New method of teaching and learning are developing whereby online courses are emerging. The academic community is depending more and more on online sources. All these circumstances have forced the university library to adopt state-of-art information communication technology for sustainable development of library and information system. We are moving from a single library to a network of libraries, from one collection to distributed collections and from the catalog interface to multiple interfaces. Today’s students are quickly using Internet for searching information. University library is continuously striving to fulfill the needs of its vast campus incorporating latest Information & Communication Technology. Systematic efforts for the development of basic infrastructure of ICT has been made by the library by developing library LAN, web server, library server, CDH server, and 256 kbps broadband VSAT internet connectivity exclusively for the library, WiFi networking, facility of video conferencing, etc have been achieved. The library has been procured CD-ROM based bibliographical Databases and provided access to various online full text journals. An integrated library automation software package Libsys is used for the management of all housekeeping activities of the library. Library catalogue is available in digital format as OPAC and Web-OPAC. A DSpace Digital Repository is also established which has rare digitized books and thesis etc. The library has developed its website (http://202.141.116.194) to integrate all the online resources for the benefit of its user for use. University Library has a highly specialised collection of 3.9 Lakh documents in the field of Agriculture, Veterinary Sciences, Animal Husbandry, Home Science, Fisheries, Basic Sciences, Humanities, Technology & other allied subjects. The collection includes books, theses, periodicals, standards, reprints, maps, toposheets, globes, microfilms, microfiches, records, tapes & CD-ROMs. The library subscribes about 500 journals in print form. The collection grows at an average rate of 4000 Volumes per year. Library is the member of CeRA (Consortium for e-Resources in Agriculture) and INDEST (Indian National Digital library in Engineering Sciences & Technology) consortia for providing contents to the users under economic pressures to support the needs of research and learning. About 3000 online journals access is provided to users through consortium and university library access right. management through a students’ food committe. I belong to this place and like this university very much. I want my son Pranshu to get admission in B Tech. in 2013. Thank you for another great article. Where else may anyone get that type of info in such an ideal approach of writing? I have a presentation subsequent week, and I’m on the search for such information.